Most of us would now look with horror if we saw a car speeding down the highway with an unrestrained baby crawling about. Thankfully, infant car seats have become the standard. But what about 4-year-olds? 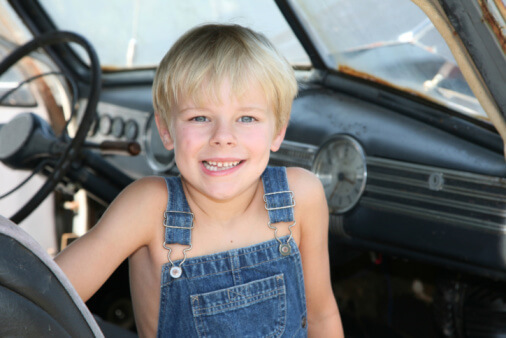 According to the March 10th, 2000 Morbidity and Mortality Weekly Report (MMWR), more children aged 4-8 years die as occupants in motor-vehicle-related crashes than from any other form of unintentional injury. This is a very vulnerable age! Having outgrown car seats, these children frequently sit unrestrained or are placed in adult seat belt systems that are not safe until children are at least 58 inches tall and weigh 80 pounds. But only 4%-6% of children aged 4-8 years use appropriate booster seats when riding in motor vehicles! Despite recommendations for children to ride in the back seat to reduce risk for injury in a crash, approximately one fourth of child passengers ride in the front seat! We’ve got to do better than this.